I am less often attacked by self-righteous liberals who see me as a conservative than by scared ignorant conservatives who think I am a liberal, or by libertarians who brand me a monarchist. Monarchists of course assume I am an anarchist, because that's how their particular little world is divided. I have never met a true anarchist, so I don't know what they think of me. Anyway, the weather cares little for the opinions of people, so why should I? The cost of being original and thinking for one's self is that you never have any allies. Being an egalitarian, I am equally critical of conservatives and liberals, and for that matter of all politicals. They all make the same stupid mistakes. They attack each other for being what they are, merely for the labels they carry, and not for anything of substance. They see only what they wish to see in order to confirm their own limited fantasies. 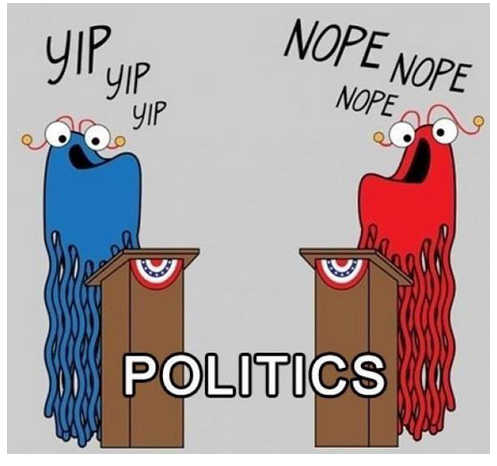 Politicals try hard to make sure there is only ever one side (their side) to every question; while workable solutions to problems require that all aspects be acknowledged and addressed. Therefore politicals are incapable of solving anything and they never produce anything of value. The major flaw in Conservatism (the thing, not the people) is that it fails to acknowledge new facts, new realities, and is incapable of responding to changes intelligently. It only knows what USED to be true. Example: Man-made global warming is a verified, proven fact and by far the most dangerous thing happening in the world now. Conservatives refuse to open their eyes to empirical truth and will therefore fail to act until it is too late. And then they will blame someone else for their xenocidal intransigence. The major flaw in Liberalism is that it fails to acknowledge what has always been true that continues to be. It thinks it is more clever than a thousand generations of humans; and its strange theories, when tested, fail again and again. Example: Wealth is the only thing that has ever prevailed against poverty, suffering, injustice, and environmental degradation. The natural facts of how wealth comes about (i.e. through individuals acting with individual freedom) and the natural human right to retain one's own property and direct one's own labor are fundamental to life itself, and not merely a fungible "system" that can be re-engineered to suit some arrogant, self-righteous academic theory. The major flaw in Libertarianism is that government and community actually do have legitimate roles in the world. Generally speaking those roles are in concentrating capital for purposes that benefit the broadest categories of people rather than those narrower needs best served by for-profit enterprises. There are certain things we will always do better as a city, as a nation or as a planet than we do as individuals or as self-selected corporate entities with a necessarily limited focus. The major flaw in Totalitarianism is that the State rarely innovates and quickly stagnates without risk-taking individuals creating wealth to begin with. It collapses in on itself leaving mass suffering in its wake, or like any purported perpetual-motion machine, it runs down and stops unless there is a continuous artificial outside subsidy. The State can never hope to successfully provide all things to all people, nor should it ever be thought of as having that responsibility. This flaw is only slightly ahead of the equally fatal flaw of being a complete violation of basic human rights, particularly the right to ownership over one's own labor or stored-labor (wealth). In other words the state that controls everything is essentially mass-slavery. Unfortunately there are many forms of Totalitarianism, and it lies at the valley of every slippery slope upon which both liberals and conservatives vigorously dance. All politicals, right, left or center, crave power and any quantity of it is never enough for them. The key to a balanced, prosperous and healthy world is keeping the politicals strictly in check; limiting their power and insisting instead that power reside within a necessarily small, efficient set of equitable laws. It lies in actively resisting the impulse which assumes that more and stricter laws are always the answer to every question, the solution to every problem. It lies in not valuing security over liberty and human rights; in accepting risk in the world and not fearfully clinging to notions of control over "the other people." It lies in abandoning the futility of subduing enemies with force while avoiding any meaningful engagement, but instead engaging with them as peers and relinquishing control to at least the extent that they have some kind of recourse other than death (yours or theirs). It means allowing individuals to retain and exercise meaningful power, and accepting the consequences of that necessity - being that people will not always act as you would wish, and sometimes your rights may be encroached upon. The needs of the many outweigh the needs of the few. Everyone needs freedom, though a few may experience some inconvenience to themselves as a result. Only slaves are 100% secure; free people must accept and bear the risks of freedom. That means that the people you are afraid of will not be under your control. One consequence of freedom as a basic human right is that those who mentally cannot endure racial, gender, cultural or religious integration are free to separate themselves and form enclaves in which they can fantasize about the world without interruption and without inconvenient facts being laid before them. I do not recommend this at all since it damns them to a state of stagnation, intellectual in-breeding, idiocy and poverty. But they remain free to do so, and we, rather than make enemies of them, must be mature enough to treat with them as peers, understand what they want and why, and be open to exchanges in our mutual best-interests. Exporting ideology is nobody's legitimate business. And that's why politics today is stupid: it is an overt attempt to export ideology and impose it upon others rather than seeking to understand others and treat with them. The constant vilification of "the other guys" is the main reason that I loudly denounce Conservatives as stupid, Liberals as stupid, Libertarians as stupid, Socialists as stupid, Greens as stupid, Communists as stupid, Islamists as stupid, Christian Fundamentalists as stupid, Monarchists, Oligarchists, Militarists, Separatists, Aryans, Racists, Gays, Homophobes, Feminists or any of these smug artificial identities as stupid. Any such identity is fundamentally based on a false assumption that "the other people" unlike you are your main problem. And that just isn't so. Your main problem is always you. My main problem is always me.